[192 Pages Report] The study involved 4 major activities in estimating the current size for the power rental market. An exhaustive secondary research was done to collect information on the peer and parent markets. The next step was to validate these findings, assumptions, and sizing with industry experts across the value chain through primary research. Both top-down and bottom-up approaches were employed to estimate the complete market size. Thereafter, market breakdown and data triangulation were used to estimate the market size of the segments and subsegments. After arriving at the overall market size from estimation process explained above, the total market has been split into several segments and subsegments. To complete the overall market engineering process and arrive at the exact statistics for all the segments and subsegments, the data triangulation and market breakdown processes have been employed, wherever applicable. The data has been triangulated by studying the various factors and trends from both the demand and supply sides. Along with this, the market size has been validated using both the top-down and bottom-up approaches. 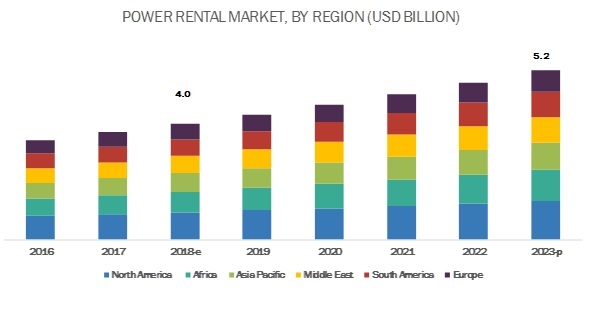 The global power rental market is projected to reach a size of USD 21.2 billion by 2023, at a CAGR of 7.89%, from an estimated USD 14.5 billion in 2018. This growth can be attributed to the limited access to electricity in rural areas and increase in power loss due to aging infrastructure. By end-user, the utilities segment is expected to grow at the fastest rate during the forecast period. The report segments the power rental market, by end-user, into utilities, oil & gas, minning, manufacturing, construction, events, shipping, and data center. Local grids lack reliable supply, mainly due to poor or lack of transmission network in regions such as Africa, Asia Pacific, and in developing countries. Unreliable supply from a local grid or limited access to the main transmission network may prohibit the delivery of electricity required to sustain production and operations. In such cases, there will be a high demand for generators, as users avoid traditional power grids to limit their use of the grid. Hence, there is continuous demand for power rental from power plants in order to ensure continued power supply. Utility companies use rental generators mainly during the peak demand period. By application, the standby power segment is expected to grow at the fastest rate during the forecast period. A standby generator is an electrical back-up system that operates within seconds of a power outage. The transfer switch senses the loss of power and accordingly starts or shuts off the generator. Most units run on diesel, natural gas, or liquid propane gas. These generators are used in hospitals, office buildings, and schools, among others. Diesel generator accounts for the largest market size during the forecast period. Diesel generators are being used for standby, peak shaving, and continuous power generation purposes for decades. The diesel generators have long running life, easy fuel availability, and quick response. These are the factors that boost the growth of the diesel generator market worldwide. The advantages of using a diesel generator is its continuous stream of voltage power, without peaks and dips of other devices, thus, helping to regulate fluctuations. Diesel generators find applications mainly in commercial and various manufacturing facilities and are also available in portable forms, which are primarily used by residential customers. These were the major reasons behind the diesel generator market holding the maximum share in 2017. In this report, the power rental market has been analyzed with respect to 6 regions, namely, North America, Europe, South America, Asia Pacific, Africa, and the Middle East. The market in North America is estimated to be the largest during the forecast period. Increasing power demand and aging infrastructure are some of the key factors responsible for the growth of the power rental market. According to National Energy Board Canada, total export of 72.1 tWh (tera watt hours) of electricity was done to US in 2017. The US government have been trying to reduce the electricity import in the country over a decade. But the increasing oil prices have impacted the growth, creating the power deficit. The deficit provides market opportunity for power rental solution. Such factors would boost the power rental market in the region during the forecast period. In April 2017, United Rentals, Inc. acquired NES Rentals Holdings II, Inc. The acquisition is expected to increase the company’s presence in the East Coast, Gulf states, and the Midwest of the US. In June 2017, Caterpillar Inc. and Ritchie Bros. formed a partnership under which Ritchie Bros. will become Caterpillar’s preferred global partner for onsite and online auctions for used Caterpillar equipment. The partnership is expected to strengthen Ritchie Bros. relationship with independent Caterpillar dealers around the world by providing them enhanced and continued access to a global auction marketplace to sell their used equipment. The report identifies and addresses key markets for power rental, which would help manufacturers review the growth in demand. The report helps system providers understand the pulse of the market and provides insights into the drivers, restraints, opportunities, and challenges. The report will help key players understand the strategies of their competitors better and make better strategic decisions. 5.2.1.2 Increase in Power Loss Due to Aging Infrastructure. 11.2.5.3.1 Aging Power Infrastructure and Growing Power Requirement are Driving the Power Rental Market in the Region. 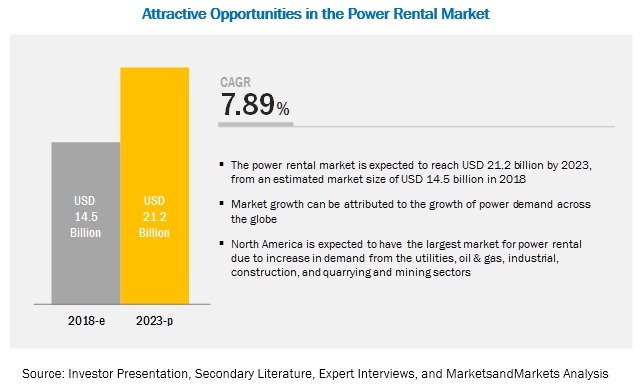 11.3.5.1.1 Aging T&D Infrastructure and Increasing Power Requirement are Driving the Power Rental Market in the Region. 11.5.5.2.1 Increasing Investment in Construction Industry is Expected to Drive the Power Rental Market in the Country.